« Tin and Rosin for Audio – which one ? Very simple soft – start for a toroid. A single relay, with a coil powered off mains / AC (in my case: 230V AC). One (or better: two series connected) miniature halogen light bulbs. That is essentially it. 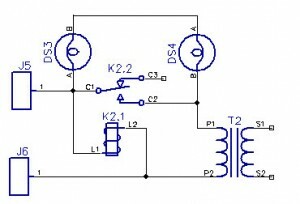 When choosing the relay, be sure that the relay is actually designed (has the magnetizing inertia) to operate from an AC voltage, instead of buzzing like crazy in havoc. At Time = 0, at switch-on, the toroid has no magnetic field circulating within its core whatsoever. At this particular moment, the current surge would normally be similar to that of the mains voltage divided by the DC-Resistance of the primary, as there is yet no magnetic field to “counter” this surge with a back electromotive force. So, sometimes, especially with the bigger sized toroid units, your fuses will keep blowing for “no apparent” reason. Two series connected light bulbs in the current path, which shall effectively limit the surge current to that what would be flowing via the bulbs. But as a side effect, this current shall also magnetize, or “soft-start” the core of the toroid, as they are all series connected. I use miniature G9 230V/28W style halogen bulbs, small format devices. Their sockets are also fairly small and easy to accommodate within the power supply housing. Until the core “spins up” with it’s magnetic field, the voltage on the taps of the toroid will be low. Actually, at T = 0, it will be sort of resembling a “short-circuit”. As long as the voltage on the toroid taps is low, the relay will not activate, maintaining the series path through the bulbs. As soon as the magnetic field in the toroid core “spins up”, the device shall begin to present a formidable impedance and the current flow will fall back to normal, reasonable operational levels. At this point, the voltage across the toroid winding taps will be significantly higher. Strictly speaking, it will be a result of a voltage divider of sorts, consisting of the bulbs and the toroid. Assuming that you pick the bulbs with a not-too-low wattage for the intended application, the resulting voltage drop upon them, after the start up, will be fairly low. On the other hand, the voltage on the toroid taps will be high enough to activate the relay, which herewith detours the bulbs and takes them totally out of the circuit. B.T.W … Why two bulbs and not simply one ? Because I am lazy and do not want to be exchanging burnt light bulbs every so often. Simply speaking, if you use two equal wattage bulbs in series, then each will be exposed to only but half of its operating voltage. Statistically speaking, under such conditions, the chances of such a bulb to burn are null. zero. zap. Essentially nothing. Put two in series, and they will live forever. Their MTBF (mean time between failure) shall essentially rocket sky high. It will be so high in fact, that you can easily hide the bulbs within the chassis of your device and simply forget about them. 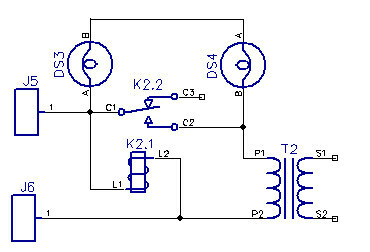 If the “load” on the secondary side is huge, and the wattage of the light bulbs too weak, then the voltage drop upon the bulbs will never decrease to a reasonable value, and hence the voltage on the winding will never increase to a level sufficient to trigger the relay. But then again, the initial surge in many amplifiers is associated with charging up the filter capacitors. This process shall eventually also end, at some point, and indeed, we shall reach a point where the load subsides, when the capacitors are fully charged up to the value of the rail operating voltages. So, either way, our chances of the relay triggering (sooner or later) are actually quite high. Nonetheless, if you want to avoid the hassle of thinking about the correct selection of bulbs. …. 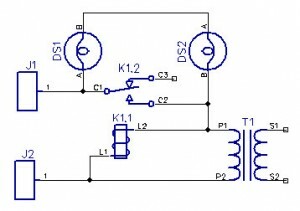 This time, the relay is simply powered directly off the incoming mains voltage. The assumption here being, that similarly as the magnetic field within the core of the toroid, also the magnet within the relay needs to magnetize. It needs to PULL the anchor of the relay, shift it’s position. All this takes a few milliseconds to occur. What we are hoping for here is that by the time that the anchor of the relay will actually “short” the light bulbs out of the circuit, that by that time the magnetic field within the toroid has picked up substantially, and hence, also it’s associated impedance, so that by this time, when we detour the light bulbs and apply the full mains to the toroid, such action will not cause any fuses to blow. Personally, I like the first solution better, because it can also milden the initial surge current of charging up the capacitors, which in a sense protects the rectifiers on the secondary side from a momentary rectification current overload. Caveat: that the bulbs are chosen such that the relay eventually activates. One last thing. It could be argued that a power resistor would be a much more elegant solution. Maybe. But what if the relay fails ? Then the resistor will be exposed to a constant power dissipation, which may well exceed its power ratings. And you would not even have a clue that something is abnormal. With the bulbs, should the relay fail, you shall see a glow of the filament, instantly indicating that the relay did not trigger and that something is amiss.